For some unknown to me reason, Navy Bean Soup for Friday’s lunch is an Air Force tradition. I believe one of the houses of Congress also shares this tradition or is possibly the originator of this classic Friday lunch. It may very well be the reason Americans like to close up shop early on Friday afternoons. Soak your beans using your preferred method. (I prefer the quick soak). Begin cooking the beans, covering with an inch of your beef broth or water & bouillon. If using bouillon; add a whopping 1 Tablespoon. A whopping tablespoon is more than a heaping tablespoon. Place the hock or bones in your kettle of beans & cover. Go ahead and crank up the heat, but remember to turn it down to simmer once it gets hot because the high heat (boiling) will burst your beans. And we all know how embarrassing that can be! Saute your onions & celery in the bacon fat and add to beans. Of course you may skip the sauteeing and add your onions & celery directly to your beans, but I rarely miss the opportunity to add bacon fat to my cooking. Add bay leaves, basil, and cloves. 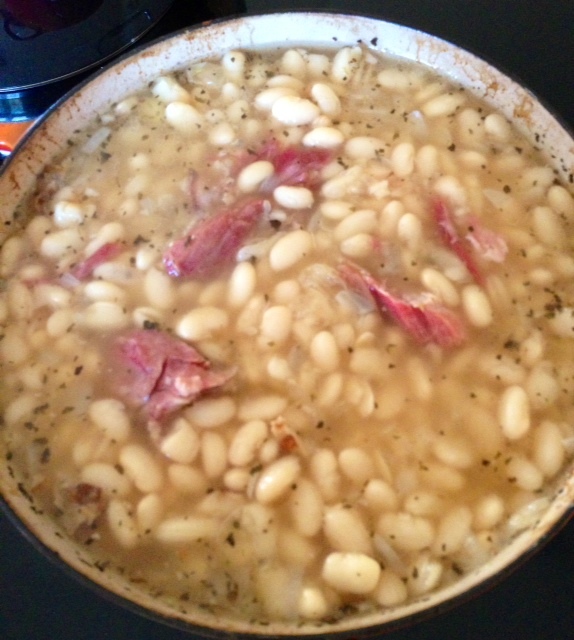 It is very important that your cloves be only a ‘quick dash’; they will quickly overpower your navy bean soup. You can always add more later. Cook until done (about 1 1/2 hr); adding more liquid and adjusting your spices as needed. Remove the bay leaves and the hock or neck bones. Pick some of the meat off the bones and throw it back into the kettle. When time to serve, have a slice of bread in the bottom of your bowl, cover it with a ladleful of beans & plenty of juice. Top with a teaspoon of squash pickles. MmmmMmmmMmmm. What is the overall cook time from start to finish? Thanks for asking. Cook time is 1 1/2 hours, but can vary from 1-2 hours, depending on the freshness of the beans and how soft you like the bean. Soak time, if you use the quick soak, is a little over an hour. should the neck bones be smoked? Yes, the smoked meat adds more flavor, but use what you have available.